On those rare occasions when San Diego gets a few rainy days in a row, it can not only put a damper on our daily plans, but also wreak havoc on our dogs’ behavior as well. 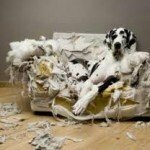 When dogs are used to going out for daily walks or are true weekend warriors, and then experience a change in routine, many dogs can become destructive, out of control, and simply unruly! Well, think of the energy level of the typical active toddler that has been cooped up for a while and you will have a better idea of what you are dealing with…..they need to get out! So what to do? Here are a few quick indoor games you can play with your dog that will not only exhaust them physically, but will challenge them mentally, resulting in a tired pooch. Engage in an old fashioned game of hide and seek. You can play this two ways. First, if you have two or more people in your house, this is a wonderful activity. Begin with each person having a handful of treats in their hand, standing somewhat close to each other (about 6 feet apart). One person calls their dog. As the dog arrives, give them a tasty treat and praise them. You can even hold onto their collar for a short amount of time to ensure they stay with you, giving them more praise and treats, if necessary. Then another person calls the dog and does the exact same thing. The players can start to move further and further away from each other, calling the dog back and forth. As the dog catches on to the game, players can start moving into different rooms, possibly “hiding” and gradually making it more challenging for the dog. If the dog can’t find you, don’t be afraid to offer a little encouragement with a whistle or noise to help the dog out. Second, if you don’t have another person around, you can teach your dog to “go find” a favorite toy or ball. Either have your dog sit and stay, or use their leash to tether them to a piece of furniture so they can’t run off. Show them a favorite toy, letting them sniff it and get excited about it, and then place the toy about ten feet away from the dog where they can still see the toy. Let your dog off leash or release them from the sit/stay and say “go find it” so they will be encouraged to get their toy. Once they have it, cheer, praise them and get a little crazy! Continue with this exercise until you are able to get the toy a bit further away and start to hide it in various places around your house. If you hide the toy in another room, you may have to help your dog to find the toy by going closer to it’s hiding place. Engage in a good game of fetch. If you have a two story house, this is an easy way to exercise your dog with little effort on your part and a lot of effort on your dog’s part. Stand at the top of the stairs and simply roll a ball down your stairs for your dog to chase. Call him back to you and continue the game. A simple game of fetch can incorporate multiple obedience commands to practice. As your dog returns to you, say “come.” Upon their arrival, ask for “drop it” to get the ball. You can ask your dog “sit” before you throw the ball, or even “down” as well. Mix it up and have fun with it! Purchase puzzle games for your dog. There are some terrific toys on the market that will both mentally and physically challenge your dog. They involve having your dog learn how to manipulate different shapes, which cause treats to be dispensed. They love it! Check out clickertraining.com or look in you local pet store for some toys by these brands: Invincibles, Dog Games, Plush Puppies, Outward Hound.